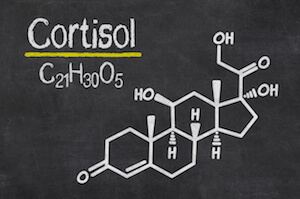 Cortisol is a steroid hormone that is produced in your adrenal glands (located at the top of your kidneys). Cortisol is involved in the regulation of your metabolism, acts as an anti-inflammatory, and helps your body respond and cope with stress. The problem in today’s world is that we have chronic stress and our cortisol system was designed for short term stress. We were designed to have periods of low to little stress in order to recover. Think about our world today: cell phones offer 24/7 access no matter where you are, the Internet allows continual access to what is going on, financial stresses abound, traffic is prevalent, etc. Basically, our mind is given non stop opportunities to worry and over think. Our cortisol responds to mental stress just as if you were in physical danger. Daily chronic stress affects your cortisol production and can lead to adrenal fatigue. You can feel tired all the time, irritable, moody; have trouble sleeping, focusing, or remembering things; have headaches or blood pressure problems. When your cortisol level is affected due to chronic stress, your Testosterone, Estrogen, and Progesterone levels will be affected as well and this causes even more symptoms. We can’t change today’s world but we can change what we do on a daily basis. I advise turning off your cell phone alerts and check your phone when you want to, not when messages come in. Turn off the phone and computer at a set time each day and unplug completely a day a week, or more. Take yoga classes and epsom salt baths. Take a deep breath as often as you can. Do what you can to minimize your stressors. Replacing your deficient hormones with bio-identical hormones is a part of the whole picture to rebalancing your adrenal gland.